Source and Product are actually one project. The premise was: For Source, everyone contributes 5 minutes of sounds. 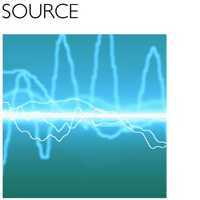 For Product, everyone contributes music using Source tracks as the only sound source. These tracks weren´t really intended as standalone musical compositions in the way that the other collections were. Part of an unfinished backing track that begged to be used for something. A synthesizer meditation that was laying unused that cried out for participation. through extensive processing (Lexicon Vortex, assorted computer manipulation). Reversed synthesizer texture evolving over time. A section of an unused track that had an interesting melodic repetition. 2 casios, talk radio loop, speed & volume manipulated. Faux drums, played manually on a keyboard. Hail to the Chief. What IS the meaning of the word 'is', anyway? I began playing oud in 1988. In 2004, I learned I'd been holding the plectrum completely wrong for 16 years. D'oh! Rafter took the "Source" idea very seriously. In one channel, he's progressing through the alphabet, attempting to make every sound used in the English language. (The intention was for other artists to be able to edit these sounds into words.) In the other channel, he created fairly basic sounds from anything in sight around his studio.